I had acute TMJ pain for six years that severely impacted my personal and professional life. Prior to meeting Dr. Rahimi, I spent countless hours and dollars on doctors and physical therapists to address the problem, but I had concluded the only path forward was simply to keep the pain tolerable enough to get by. I will forever be grateful that I connected with Dr. Rahimi because my pain is almost entirely gone. Dr. Rahimi demonstrated a combination of knowledge, communication skills, compassion, and efficiency that gave me a ton of confidence in him and got me feeling better after just a few visits. These symptoms are often so severe thus disabling one from normal daily activities and altering one’s quality of life. Dr. Rahimi works with board certified craniopathic specialists utilizing cranial-dental procedures in treating these TMJ disorders. Working together, a balanced bite is achieved. Treatment might include bite adjustments (removing and re-contouring high spots and premature contacts on teeth and restorations), and/or fabrication of an occlusal (bite) splint orthotic to protect the jaw and muscles from clenching/grinding. 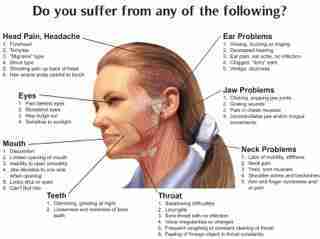 There are many factors which can cause or contribute to TMJ disorders. They include trauma – any blow to the head or chin, whiplash injury, poor posture, abnormal bite (malocclusion), arthritis and hereditary growth and development factors which contribute to skeletal malformation. Stress at work or home also has an impact on TMJ disorders. Muscle strain and spasm begin when the disc becomes displaced. Early signs of a TMJ disorder usually include clicking or popping noises. More severe displacements can be very painful. If left untreated, permanent change can result. Often proper treatment can alleviate months or years of pain and suffering. Treatments vary considerably with each individual patient and may include fabrication and fitting of precise, custom-fitted orthotic appliance (sometimes called “splints”) to realign and stabilize the jaw joint, restore comfort and improve jaw function. Los Gatos Dentist Dr. Rahimi is board certified Diplomate by the American Board of Craniofacial Pain; Dental Sleep Medicine (ABCDSM) and strives to achieve a balanced bite (occlusion) to relieve acute and chronic Head, Jaw and Facial Pain. Treatment might include fabrication of occlusal decompression orthotics to appropriately reposition the jaw and muscles to reduce clenching/grinding, physical medicine including Cold Laser, Ultrasound, TENS, Trigger Point injections, Prolotherapy, chronic pain nutrition and screening for Sleep Breathing Disorders (SBD) which can cause sleep bruxism.